Leg pain is a common problem. It can be due to a cramp, injury, or other cause. Legg-Calve-Perthes disease occurs when the ball of the thigh bone in the hip does not get enough blood, causing the bone to die. Take over-the-counter pain medicines like acetaminophen or ibuprofen. Other homecare will depend on the cause of your leg pain. The painful leg is swollen or red. Your pain gets worse when you walk or exercise and improves with rest. The leg is black and blue. The leg is cold and pale. You are taking medicines that may be causing leg pain. DO NOT stop taking or change any of your medicines without talking to your provider. Self-care steps do not help. Your provider will perform a physical exam and look at your legs, feet, thighs, hips, back, knees, and ankles. Where on the leg is the pain? Is the pain in one or both legs? Is the pain dull and aching or sharp and stabbing? Is the pain severe? Is the pain worse at any time of day? What makes the pain feel worse? Does anything make your pain feel better? Do you have any other symptoms such as numbness, tingling, back pain, or fever? Your provider may recommend physical therapy for some causes of leg pain. Ginsberg J. 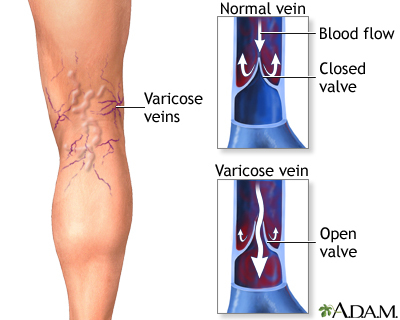 Peripheral venous disease. In: Goldman L, Schafer AI, eds. Goldman-Cecil Medicine. 25th ed. Philadelphia, PA: Elsevier Saunders; 2016:chap 81. Marcussen B, Hogrefe C, Amendola A. Leg pain and exertional compartment syndromes. In: Miller MD, Thompson SR, eds. DeLee & Drez's Orthopaedic Sports Medicine: Principles and Practice. 4th ed. Philadelphia, PA: Elsevier Saunders; 2015:chap 112. Silverstein JA, Moeller JL, Hutchinson MR. Common issues in orthopedics. In: Rakel RE, Rakel DP, eds. Textbook of Family Medicine. 9th ed. Philadelphia, PA: Elsevier; 2016:chap 30. 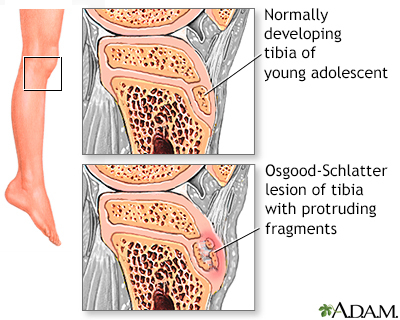 Leg pain in older children or young adolescents can occur for many reasons. An Osgood-Schlatter lesion results from continued trauma to the anterior tibial bone and causes a visible lump below the knee. Shin splints is the common name for the medical condition called medial tibial stress syndrome in which pain occurs along the tibia (shin bone) in the front of the lower leg. The pain is a result of small tears in the area the lower leg muscles attachment to the tibia. Shin splints are typically caused from intense or vigorous athletic activity and can be resolved with adequate rest, stretching and modifying your exercise routine. 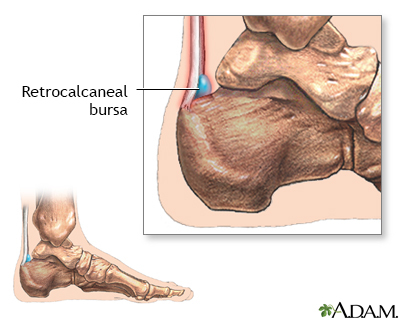 Retrocalcaneal bursitis is an inflammation of the bursa at the back of the heel bone. A bursa is a fluid-filled sac that acts as a cushion and a lubricant between tendons and muscles sliding over bone. Repetitive or over use of the ankle, by doing excessive walking, running, or jumping, can cause this bursa to become irritated and inflamed. Symptoms of bursitis include pain in the heel, especially with walking, running or when the area is touched. 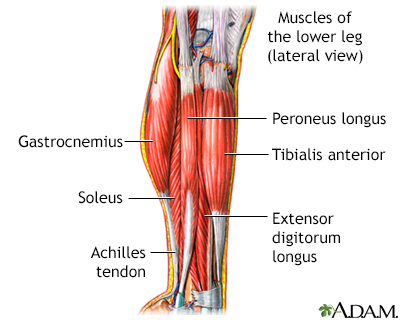 The muscles in the lower leg are divided into several compartments. 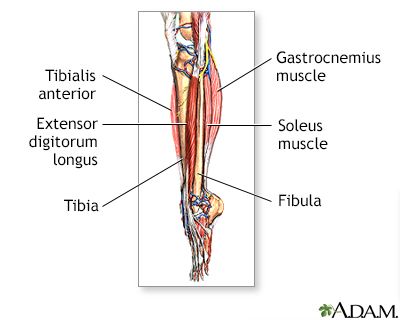 The muscles in the anterior compartment include the tibialis anterior, extensor halluscis longus, extensor digitorum longus, and peroneous tertius. This group of muscle primarily extends the toes and dorsiflexes the ankle. When there is inflammation in the anterior compartment a painful condition called shinsplints can occur.